If there’s one Instagram account I’ve stalked followed since the early, early days of Lonestar Southern, it’s @SarahKJP. I have a hunch that most of you reading this are already well acquainted with the New Englander’s chic sense for classic, preppy style, but if not drop what you’re doing and see for yourself here! She, along with her husband Kiel, embody that timeless, east coast lifestyle. Each photo and post they put together is a peek into a way of life that this Texas girl can’t help but dream about! Earlier this year, the Kiel James Patrick team released apparel for women, and it’s everything my classic, preppy dreams are made of. 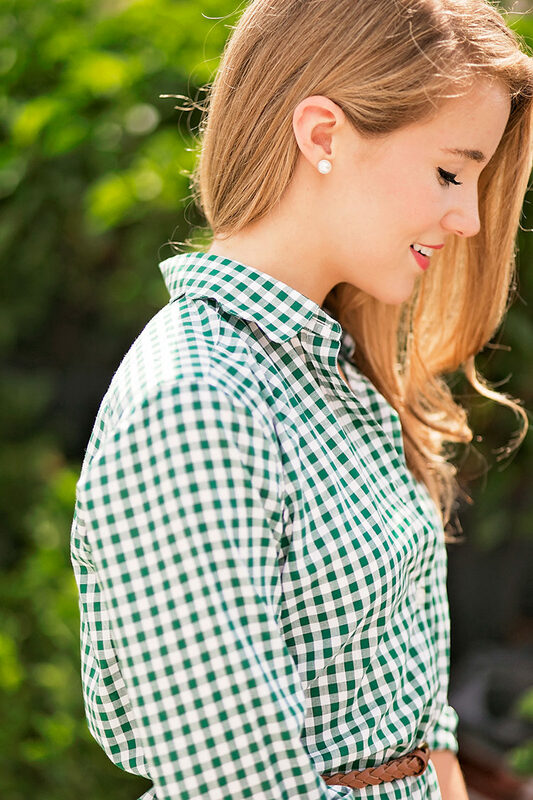 Think timeless button down silhouettes, gingham, and scalloped hems. Each detail is carefully thought of and made right here in the USA. The Kiel James Patrick team was kind enough to send over their hunter green Jamestown Picnic gingham button down dress, and it’s safe to say I’m in love. This is a piece that will not only be in my closet for years thanks to its timeless style and gorgeous quality, but one I can wear cross-seasonally as well! During these summer months, I’ve paired it with sandals or wedges and my favorite straw bag. I plan on switching those out for riding boots or ballet flats for fall, and topping it with a favorite cardigan or blazer. This dress is also offered in a navy gingham, a blue and white stripe, and a solid white and solid blue. I’m dying for a second, but can’t decide which to choose! Now it’s time to eagerly await their fall/winter line… I have a hunch it’s going to be perfection. P.S. A note on fitting: I ordered an XS, and had it hemmed up a few inches. Hope this helps! I love how the gingham is green! I feel like gingham is usually blue so this is a fun twist. Yay! Chloe and I have been waiting for this post! We loved meeting you and Angie that day at Ruibal’s in Farmers Market. It was an awesome surprise to see you taking photos in our neighborhood. You are even cuter in person and so sweet! Adorable! I love the green color on you! Perfect classy transition to fall! As soon as I peeped this post, I knew that this dress would be perfect for fall with some cognac colored riding boots-beautiful! This dress looks amazing on you! Thank you so much for sharing it! Wish I could have seen you on Nantucket. Your trip looked perfect! This dress looks so cute on you, Kate! I love the green gingham!